Check out this year’s topics. Join us on November 2. Let Canada hear from you! agriculture bring to the table? Competition date is November 2, 2019. 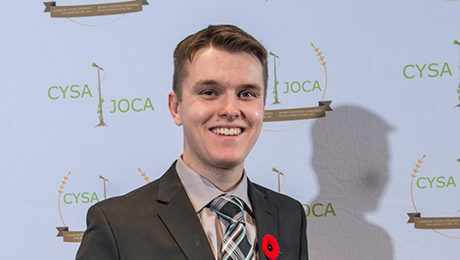 CYSA's mission is to provide Canadian youth with a professional public speaking competition through which they can develop communication and workforce skills demanded by Canada's competitive agriculture and agri-food industry. To show our commitment to sponsors who help strengthen the industry by supporting future advocates and leaders. To inform the urban population about agricultural issues. On November 2nd, join the young Canadians who are speaking up for agriculture! Are you passionate about farming? Do you enjoy sharing your views with others? The Canadian Young Speakers for Agriculture competition could be your time to shine! Contestants prepare a five to seven minute speech on one of five agriculture-related topics, and present it at the Royal Agricultural Winter Fair in Toronto. Prizes are available for two age groups: Junior (11 to 15) and Senior (16 to 24). The 2019 competition will be held Saturday, November 2. We won’t share your email address with anyone, and you can unsubscribe at any time.